2017 Tornado Statistics - Ontario Storms Site! (3) Jul.12, 2017 - 16:20 - Waterspout - Lake Simcoe: Southwestern and Central Ontario experienced strong storms during the afternoon and evening hours on Wednesday. At approximately 4:20 PM Wednesday afternoon, a tornado occurred over Lake Simcoe near Georgina Island. Tornadoes that occur over bodies of water are known as waterspouts. This particular waterspout had the capability to move inland and do damage but to this point in time, no damage has been reported in that area. (4) Jul.12, 2017 - 19:00 - EF0 - Lucan: At approximately 7:00 PM on Wednesday, a tornado occurred just to the north of Lucan in Middlesex County. Environment Canada received a number of reports through social media of this event and the damage that ensued. Engineers from Western University in London conducted a damage survey and concluded that this was an Enhanced Fujita Scale 0 (EF0) tornado with peak winds of 130 km/h. The length of the damage path was 5 km and the maximum width was 170 metres. The tornado uprooted some trees and overturned some trailers on a farm property. (5) Jul.12, 2017 - (possible tornado) - 20:20 Drumbo: At approximately 8:20 PM on Wednesday, the same storm cell that spawned the Lucan tornado generated a possible tornado in the Drumbo area. Environment Canada has received images of a funnel cloud in this area. At this time, there is no evidence that a tornado occurred and caused damage. The investigation into this event continues. (6) Aug.4, 2017 - 15:32 - EF1 - Huntsville: STRONG THUNDERSTORMS DEVELOPED AHEAD OF A COLD FRONT FRIDAY AFTERNOON OVER SOUTHERN ONTARIO. AN EF-1 TORNADO IS CONFIRMED TO HAVE TOUCHED DOWN ON THE SOUTH SIDE OF HUNTSVILLE AT 3:52 PM. THE TORNADO TRACKED ABOUT ONE KILOMETRE NORTHEASTWARD OVER LAND AND THEN FOR ANOTHER ONE TO ONE AND A HALF KILOMETRES OVER FAIRY LAKE AS A TORNADIC WATERSPOUT. DAMAGE WAS REPORTED TO A NUMBER OF HOMES AND NUMEROUS TREES WERE TOPPLED. THE WIDTH OF ITS PATH IS ESTIMATED TO HAVE RANGED FROM 100 TO 150 METRES WITH WIND STRENGTH OF 130 TO 150 KM/H. PLEASE NOTE THAT THIS SUMMARY MAY CONTAIN PRELIMINARY OR UNOFFICIAL INFORMATION AND DOES NOT CONSTITUTE A COMPLETE OR FINAL REPORT. (7) Aug.4, 2017 - 16:10 - EF2 - Huntsville: The second EF-2 tornado occurred approximately 15 km northeast of Huntsville likely between 4:10 and 4:15 PM Friday. From the storm damage survey it appears the tornado produced winds up to 190 km/h and had a track length of nine kilometers. Currently it is believed this tornado started near Pell Lake and moved northeastward to Rebecca Lake then continued to Dotty Lake. The width of the damage path is estimated to range from 100 to 200 metres. The tornado caused extensive tree damage as well as structural damage to cottages. (8) Aug.4, 2017 - EF1 - Utterson: A third tornado has been confirmed to have occurred this past Friday August 4th, 2017 in the Huntsville area. The Environment and Climate Change Canada storm investigation determined that the tornado occurred near the community of Utterson which is approximately 13 kilometres southwest of Huntsville. The tornado has been classified as an EF1 with a maximum wind speed estimated at 160 km/h and a path length of 4.2 kilometres and a maximum width of 250 metres. Please note that this summary may contain preliminary or unofficial information and does not constitute a complete or final report. (9) Aug.11, 2017 -17:40 - EF0 - Leamington: Late Friday afternoon, a thunderstorm moved from lower Michigan across Essex County and reached Leamington near 5.40 PM. Photographs taken at that time support the confirmation of an EF-0 tornado with maximum winds of 130 km/h. The tornado damaged solar panels and a greenhouse. (9) Aug.11, 2017 -19:30 - EF2 - Hawksville: Environment Canada damage assessment team has confirmed an EF-2 tornado near Hawksville at about 7:30 PM. The tornado moved from west to east across Hawksville then to just south of Elmira and then toward the village of Maryhill. The track is estimated at about 5 kilometres. Farm building and sheds were damaged with one anchored shed completely destroyed. Farm equipment weighing over a ton was knocked over including a fork lift, a metal press and a grain drill. Power lines were snapped. 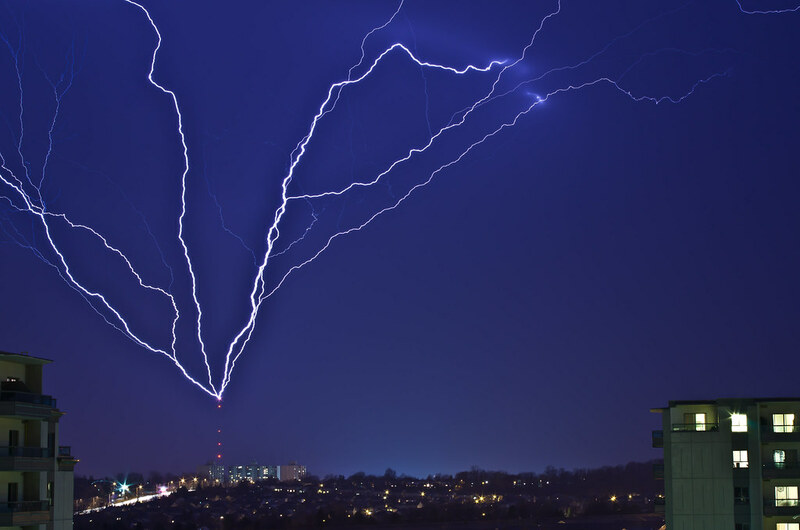 Continuous lightning was associated with the twister. Maximum winds are estimated at 180 km/h. (10) Sep.22, 2017 - EF0 - 80km NW of Kenora -A NUMBER OF THUNDERSTORM COMPLEXES DEVELOPED OVER EASTERN MANITOBA DURING THE LATE AFTERNOON THEN CROSSED THE ONTARIO BORDER IN THE EARLY EVENING HOURS. ONE THUNDERSTORM WAS PARTICULARLY INTENSE AND CAUSED SOME DAMAGE TO A REMOTE CABIN AND NEARBY TREES ON WERNER LAKE, ABOUT 80 KM NORTHWEST OF KENORA. SUBSEQUENT ANALYSIS HAS CONCLUDED THAT THE DAMAGE WAS PROBABLY CAUSED BY A TORNADO WITH MAXIMUM WINDS OF 120 KM/H, WHICH IS AN EF-0 ON THE ENHANCED FUJITA SCALE. DETAILS CONCERNING LENGTH OF THE DAMAGE PATH ARE DIFFICULT TO CONFIRM. THE DAMAGE WIDTH IS ESTIMATED TO BE 30 METRES. FORTUNATELY, NO INJURIES WERE REPORTED. Last edited by DarkSky; 09-30-2017 at 12:30 PM.